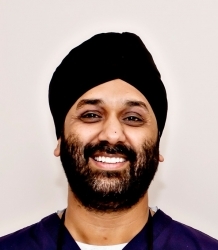 Dr Boota Singh Ubhi has been providing dental implant treatment in Birmingham for over 16 years. Boota became a General Dental Council registered specialist in Periodontics in 2000 after completing specialist training at Liverpool University from 1995-1997. Boota is committed to continuing education and advancing techniques in the field of dental implantology. He has taught at both Liverpool and Birmingham Universities and continues to lecture nationally and internationally on periodontics and the surgical aspects of dental implant treatment and bone/soft tissue augmentation procedures. He has successfully placed over 3500 dental implants and also runs formal implant training courses for general dentists. Boota is a member of the British Society of Periodontology, the Association of Dental Implantology (UK) and the American Academy of Periodontology. He qualified from Liverpool University in 1992. Patients just beginning to think about dental implant treatment may find it helpful to attend a complimentary preliminary consultation with the implant coordinator. This appointment does not include a clinical examination and X-rays. The discussion will help you consider the options for treating your dental problems and decide whether to proceed to a clinical consultation for implants. The preliminary consultation is free of charge for visitors enquiring through this website. Please use the button in the right hand column to request an appointment. Once you have decided in principle that you want implant treatment, the next step is a clinical consultation. This includes a comprehensive oral examination, and results in production of a fully-costed individual plan for your treatment. The fee for the clinical assessment appointment and provision of your personal treatment plan is £135 including X-rays. The cost of the treatment planning consultation is refunded when you proceed with the treatment. The practice offers the services of a specialist prosthodontist, orthodontist and endodontist. We also carry out cosmetic dentistry. Laboratory technician services are also available. Referrals are accepted for all types of dental implant treatment. Referring dentists are welcome to observe the procedures. We accept referrals for complete treatment or surgical treatment only, allowing the GDP to restore, with our guidance if required. BPI Dental is an award winning, multi-speciality, well equipped dental practice. The clinic has been providing implant dentistry for over 15 years in a caring and friendly environment. Particular focus is placed on advanced cases and full arch reconstructions. The practice is involved in research and provides teaching and mentoring facilities.